I have concluded that all the computer models are going out of their minds right now. Every run seems to be drastically different from the rest. Right now I would say there is a 70% chance that this storm will take the rainy track and 30% chance that this storm will take the snowy path. The numbers are subject to change as we get closer to the 13th. 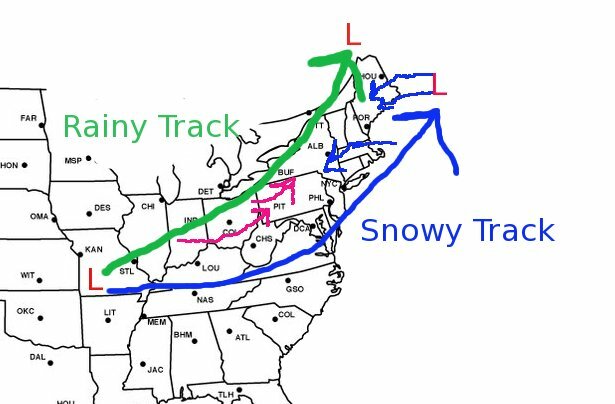 These tracks are the outliers for the models, a most likely track would come in between these tracks; giving us snow at the onset, then changing to rain before changing back to snow at the back-end. My current prediction: I will not make a prediction until Thursday because of the great uncertainty at the moment. I would say that the big blizzard solution is pretty unlikely right now, but you never know what could happen over the next few days. This upcoming storm could be one of the largest snowstorms ever in December history, or it could be one of the largest rainstorms in December history. My job is to try to decipher which one it will be. Many people have asked me if 12-15 inches is a realistic estimation for this storm. As of the computer model trends right now, this is DEFINITELY NOT a realistic estimation. Most weather models seem to be in consensus with each other for a storm that’s 7 days away (which is pretty ridiculous if you ask me). They are showing a low pressure system chugging along the jet stream and riding it into the Great Lakes, bringing in warm air from the south and making this snowstorm a gigantic rainstorm (2-3 inches of rain). I know this won’t excite many people and will probably be a big disappointment, but right now that’s how this storm is being portrayed. Do not lose hope on this storm. It is a week away; I have seen plenty of storms go from a Great Lakes Cutter to a gigantic Nor-Easter on the weather models (example last December 19th). As we get closer to Dec 13th, the trends of the weather models will give us a better prediction of what this storm is going to turn out doing. Right now the trend is west, but in a few days it could shift 500-600 miles east (I’ve seen it before!) and turn into the 12-15 incher I was talking about yesterday. I will post again tomorrow and talk about the trend and whether we still have a chance at this storm.